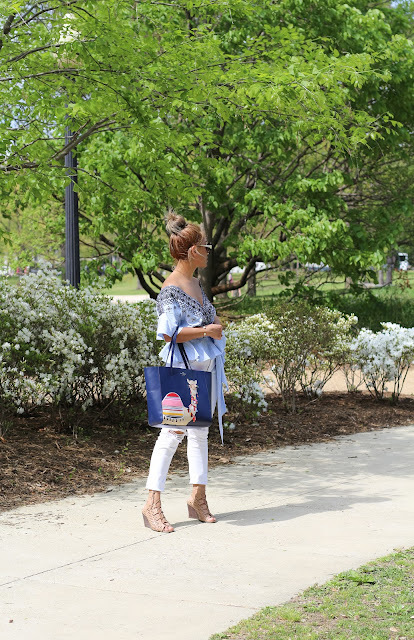 On today's post I will be sharing one of my favorite trends this Spring. The off the shoulder and bell sleeves, top. They are so comfortable, feminine and really easy to style. I'm wearing this brigitte off the shoulder top. This elegant piece is made with an Eco - textile blend. This wrap top sits right at the shoulder with an embroidered neckline and flounce sleeves. For this look, I wore my white Ripped Skinny jean and my super comfortable lace up wedges. You can also style this off the shoulder top with black skinny jean, as the embroidered neckline it's black, add pointy toe pumps and voilà you're ready. Beautiful beautiful beautiful. I love the color and fit of the top! !